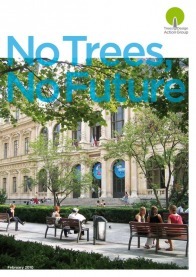 No Trees, No Future provides a summary of what research tells us about the importance of trees to our well-being and to the future of our towns and cities. It explains why it is crucial that we protect and plant larger varieties of trees and demonstrates that by incorporating trees into new development the financial, social and environmental value of the resulting place can be greatly increased. This pamphlet also provides some advice on key points to consider to ensure that trees are allowed to thrive while development takes place. No Trees, No Future was developed in collaboration with and thanks to support from English Heritage and CABE Space.